I created this card using Wanna Be Bunny Girl from Sassy Cheryl Stamps. Each piece of my card is white cardstock backed in berry blush cardstock and the edges of the white are inked using a pastel pink chalk ink pad. I colored the image using crayola and prisma colored pencils. I finished off the image by chalking the background using green and blue chalk, cut it into an oval and backed it in berry blush. 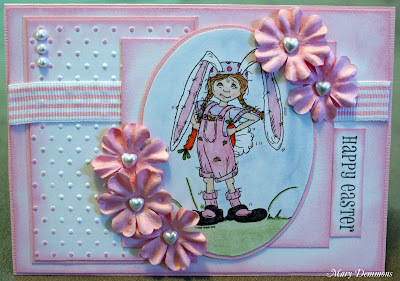 Super cute card, love the image, your colours and the flowers. Thanks for joining us at Lexi's Creation this week.